Traveling is one of the most profoundly satisfying things. It goes back to the human species’ nomadic tendencies and the drive of wanderlust. When you give into that very same wanderlust and find a new and exciting place it’s an incredibly fulfilling experience. So many possibilities are suddenly open to you and the sky's the limit as to how much you can see and feel and what new experiences you’ll have by day’s end. So when you’re deciding where you should go to slate that wanderlust, think of Alaska. J-Dock Sports Fishing offers an inclusive resort trip that will let you take in the sights of Alaska and enjoy all that the beauty our great state has to offer. In fact, apart from being one of the most beautiful areas in the United States, Alaska is home to a variety of different breweries. If you enjoy fishing and salty sea spray misting your face while the sun sets over the cold, greenish-blue waters of the Pacific, you’ll probably enjoy a cold delicious beer that is the flavor of our vibrant land. 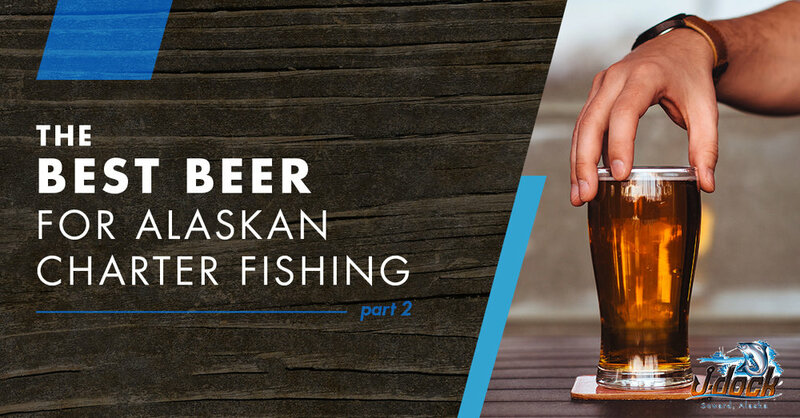 Create the best Alaskan Charter Fishing trip by savoring the sunshine, huge big game fishing prizes, and complement it with some of the beers we believe are must trys. One of the crown jewels of the Alaskan brewing culture is Anchorage brewing. Apart from their warm and beautifully designed taproom, their production quality is top-notch. There’s a reason that they distribute both locally and internationally. They’ve featured collabs from high-end breweries like New Belgium and Hill Farmstead and it shows. Their brews are bottled and sold in the local liquor stores, so you won’t need to make a pilgrimage all the way over to Anchorage and away from J-Dock to enjoy their beer while you’re own the charter fishing boat with the crew. Complement the warm summer sun with their Crazy Ray’s IPA or savor the chill of the water with a deep and delicious imperial stout like their Darkest Hour. If you’re particularly adventurous, give their tasty black sour ale the Anadromous a try. It’s Anchorage’s take on the whiskey barrel aged ales but it’s also been aged in pinot noir barrels for the tart taste to mix with smokiness of the whiskey. Baranof Island is actually a historic and fascinating area. It used to be the Russian capital of the territory when Alaska was a part of Russia. When Russia signed the territory over to the United States, the deal happened in Baranof. However, the city now boasts the Baranof Island Brewing Company. The various beers are named after areas around the brewery like the Peril Strait, a narrow strait with strong tides not far from Baranof. Although, our favorite brew has to be the Halibut Point and not just because it mentions one of the most delicious fish you can catch on your sports fishing journey with J-Dock, but also because it’s a mellow hefeweizen that anyone can enjoy. It’s an everyday beer, named after an entirely unique fish. If you love sockeye salmon, you’ll like the Redoubt Red Ale, named after Redoubt Bay, a hot fishing spot for that very same fish. The beer’s roasty flavor with a mildly hoppy undertone allows the brew to pair quite well with the salmon you’ll catch on your charter fishing trip. Located in Talkeetna, Denali Brewing makes for the perfect stop if you’re headed to look at the tallest mountain in all of North America. While many bars feature some of this brewery’s beers on tap, you won’t be able to try some of their more experimental, and arguably better, brews unless you take a visit to the brewery armed with a growler to take your favorite brew back with you to enjoy on the fishing boat. One of their more unique brews that you'll find there is the Agave Gold. They carefully brew this beer using organic blue agave nectar. The composition creates a tasty golden ale that is the perfect gateway beer to start enjoying craft beers. If you’re feeling adventurous or you’re a veteran of craft brews, you’ll totally love the purple haze. With a 5.6% ABV, it’s lighter weight than most sours and fruit beers. Brewed with 10 lbs of wild blueberries per barrel, this wheat beer is anything but average. If you’re interested in enjoying Alaska’s stunning natural beauty with a line in the icy blue Pacific ocean, contact J-Dock Charter Fishing. Our sports fishing packages feature a beautiful cabin resort, fully equipped crew and charter fishing boats with world class cooks that will prepare your fresh caught fish for your table that night. Come make memories that are as unparalleled as the Alaskan landscape. Book your trip today.